All photos courtesy of Amanda Lynn. I’ve had my share of fangirl moments when writing this blog. Talking with or meeting the person behind the mural only helps to add more context to a piece. Yes, some mystery is fun — and many a street artist likes to keep his/her identity hidden — but sometimes knowing the thought process behind a specific piece just makes it more meaningful. Or, you know, you might just want to talk to the person because they seem super interesting. I first ran across Amandalynn‘s work in San Francisco and her female figures seemed to peek out at me from every corner of the city. The SF-based artist often teams up with Lady Mags to create work under the team tag Alynn-Mags. She often depicts enigmatic women surrounded by flowers and other natural elements. In addition to large-scale murals, she also creates fine art. The women are strong and confident, often looking straight out at the viewer as if they know a secret the viewer doesn’t know. Amandalynn’s line work is fluid and vibrant, no doubt due to the fact that she often uses brushes. She graciously answered a few of my questions via email, check them out below! Your pieces often feature photorealistic faces. 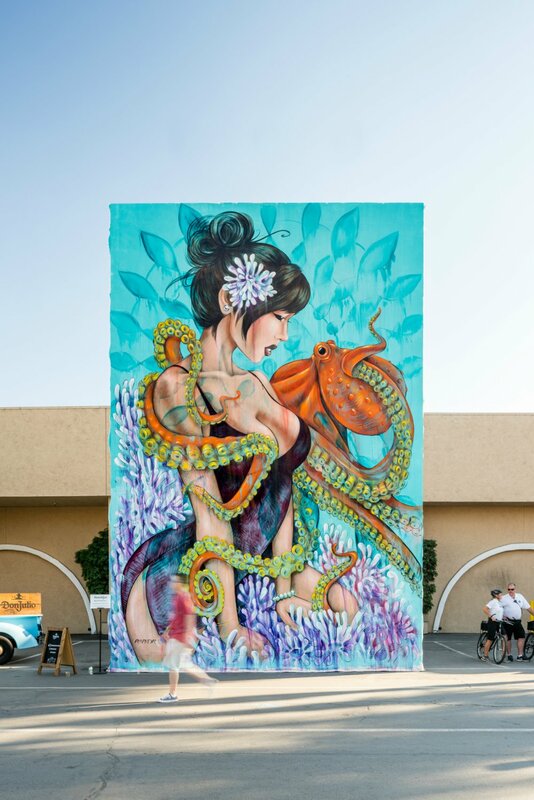 Who are the women in your murals? The women in my murals are inspirations I find through the women around me. I find these images in personal photos, books, magazines, and the web, then manipulate them to fit into my fantasy-like world. A lot of your murals are collaborations with Mags. How did you two meet? I met Lady Mags in 2011, we shared a car ride back to San Francisco from Los Angeles. After talking for 5 hours straight, she invited me to paint a wall with her. I never imagined that I would find so much inspiration and life long friendship from painting murals and fine art together, and I feel incredibly lucky to have her as my artistic partner! When you have a blank wall and full spray cans, what color do you reach for first? Well I don’t use a lot of spray paint, I am much more of a brush painter, and my first color is always black! I tend to rely heavily on my underdrawing and sketches to layout my imagery. I then apply depth and shadows through different color layers and washes. What is one of the most challenging surfaces you’ve worked on? I worked on a wall this year that had grooved siding, electrical wires, painted windows, random nails, a bum camp and lots of human pee everywhere… I ended up using a lot of spray paint on that wall because the surface was too intense for brush. And yes! I also wore gloves! Is there somewhere in the world you would love to paint that you haven’t already visited? Yes! I actually would love to paint all over the world. My international painting experiences have been my most favorite. I really love painting in smaller communities, it’s extremely rewarding to have locals get excited about what you are doing, and even if there is a huge language barrier, art creates a universal language we all can connect with. This entry was posted in interviews and tagged Alynn-Mags, Amanda Lynn, art, fine art, murals, public art, street art. Bookmark the permalink. I totally agree with her last statement. Isn’t it great to hear? I sometimes think we take for granted that art (especially public art) can cross language barriers.